Patrick G. Burns | Greer, Burns & Crain, Ltd.
Patrick G. Burns is a founding shareholder at Greer, Burns & Crain in Chicago. The emphasis within his practice today is patent prosecution and opinions. An accomplished intellectual property attorney in the United States, Mr. Burns has handled litigation involving a variety of intellectual property disputes in the Federal Circuit, Federal District Courts, and the International Trade Commission. Mr. Burns is a prolific author and lecturer on intellectual property rights, and has taught in a seminar for the Patent Resources Group entitled “’Designing Around’ Valid U.S. Patents” since 1994. All aspects of patent infringement are addressed in “’Designing Around’ Valid U.S. Patents” including opinion preparation, claim interpretation, the doctrine of equivalents, the doctrine of prosecution history estoppel, legitimate design-around activities, and techniques for avoiding legitimate design-arounds. Mr. Burns is active within the IP legal community. He served on the Advisory Board of BNA’s Patent, Trademark & Copyright Journal. 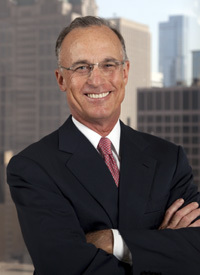 He is a past President of the Intellectual Property Law Association of Chicago, has served on its Board of Managers, and was Chairman of its Computer Technology Committee. In addition, Mr. Burns is a past Chairman of the Patent, Trademark and Copyright Committee of the Chicago Bar Association, and has been involved in bar association activities throughout his career. Mr. Burns is an Adjunct Professor of Law at Chicago-Kent College of Law. He received a Distinguished Alumni Award from the Chicago-Kent IP Law Society in 2009 and an Alumni of Distinction Award in 2013. Rated AV Preeminent by Martindale-Hubbell since 1984, Mr. Burns was named an Illinois Super Lawyer by Law & Politics Magazine and a Leading Lawyer by the Chicago Law Bulletin. Mr. Burns received a B.S. Degree in electrical engineering from the University of Illinois in Urbana in 1972 and a J.D. degree from Chicago-Kent College of Law in 1978.